Reportedly, the taxpayer principal, Doug Dickens, had been outspoken and intimidating toward Mr. Paschal. Apparently several persons overheard loud talk and somewhat aggressive statements. On one occasion, Mr. Dickens reportedly brought the Sheriff with him and made some unfriendly comments to the Chief Appraiser. Readers of AVOC know that Tax Assessment Controversies are frequently reported.While in office, and as a former county attorney, I basically stayed out of tax assessment matters.By law, assessors and appraisal staff have a degree of independence or autonomy not applicable to other employees.This is done to protect all parties and the tax system from political involvement. My position was always to tell the taxpayer to go through the Assessor Appeal process and if they could not get satisfaction, then they could appeal to the Tax Equalizers, an independent board appointed by the Grand Jury. My attitude toward the Assessors office was to support them with qualified staff, training, equipment, and to allow them to do their jobs. Most appeals never even reached the Equalizer stage and none, to my knowledge, ever reached the Courts. Tax assessment policies and procedures can be an emotionally packed process.Taxpayers are frequently upset about their assessments and they want redress at the courthouse.Most citizens are reasonable and settle down and work with the system.Most Tax Assessor staff are experienced in such matters. Recently, AVOC made an Open Records request of the Tax Assessors for appeals in the last year. Dickens Farms, Inc. had challenged a penalty for breach of the Conservation Covenant on a tract sold in the summer of 2004.Some of the issues are technical and AVOC does not comment on those issues because they are not a frequent occurrence.The outcome of the Dickens Farms Matter did result in a change in policies and return of penalties assessed in four other cases, subject to the approval of the Board of Commissioners. AVOC questioned the Chief Appraiser, Todd Paschal, who acknowledged that it was unusual for the Commissioners Office to become involved in such matters. Reportedly, the taxpayer principal, Doug Dickens, had been outspoken and intimidating toward Mr. Paschal. Apparently several persons overheard loud talk and somewhat aggressive statements.On one occasion, Mr. Dickens reportedly brought the Sheriff with him and made some unfriendly comments to the Chief Appraiser. After listening to the technical explanation, all parties agreed to allow the appeal and to also to approve the waiver or refund of previous Taxpayers who had paid a penalty under similar circumstances. In the long run, the new policy will be more stringent in dealing with land sales and breaches of the Conservation Tax Covenant. In such situations, nobody probably wins.Tax matters cause much tension locally but they are based on State Law. Tax assessments and policies must be uniform under state law. In other words, everybody has to be “fed from the same spoon’. Elected officials would be well advised to stay out of the process. Let law and policies determine tax matters rather than politics. 2. 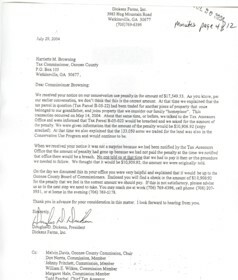 July 29, 2004 Letter from Doug Dickens, President of Dickens Farms, Inc. to Tax Commissioner Harriette Browning with copies to the . 5. 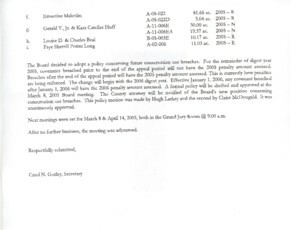 February 8, 2005 Board of Assessors Meeting to address matter resulting in Change in Policy and adjustment of five previous penalties assessed in similar situations. 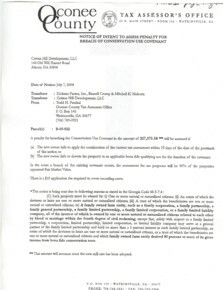 3-28-05 Oconee Tax Assessment Info - “Dickens Farms, Inc.
Doug Dickens, President of Dickens Farms Inc" has made a request to the Oconee County Board of Commissioners to waive a portion of the tax conservation use penalties on Tax Parcel B.05-022. County Attorney Daniel Haygood has advised us that this is a matter for the Board of Tax Equalizers. Please consider this communication as a continl.1ed request from Mr. Dickens. I am enclosing copies of the correspondence and documentation we have in our files at the Board of Commissioners .office. If I can provide any further information., please do not hesitate to contact me. 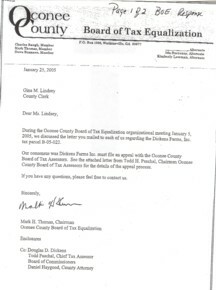 During the Oconee County Board of Tax Equalization organizational meeting January 5, 2005, we discussed the letter you mailed to each of us regarding the Dickens Farms, Inc. tax parcel B-O5-022. Our consensus was Dickens Farms Inc. must file an appeal with the Oconee County Board of Tax Assessors. 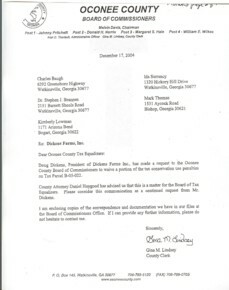 See the attached letter from Todd H. Paschal, Chairman Oconee County Board of Tax Assessors for the details of the appeal process. Meeting was called to order by Todd Paschal. Minutesof January 11, 2005 meeting were unanimously approved as written. The motion was made by Hugh Larkey and the second by Claire McDougald. Todd Paschal was instructed by the Board to have the County Atton1ey review this decision to be sure that the Board of Tax Assessors has the statutory authority to make such a ruling. He was instructed to meet with the, County Attorney in person as soon as possible and inform the Board members by phone of the attorney's opinion. The appointment was set for 9:00 AM on February 9, 2005 with Daniel Haygood. The decision to require the in-person meeting was unanimously approved and the motion was made by Buddy Downs, the second by Hugh Larkey & Claire McDougald. The Board decided to a adopt a policy concerning future conservation use breaches. For the remainder of digest year 2005, covenants breached prior to the end of the appeal period will not have the 2005 penalty amount assessed. Breaches after the end of the appeal period will have the 2005 penalty amount assessed. This is currently how penalties are being enforced.The change will begin with the 2006 digest year. Effective January 1,2006, any covenant breached after January 1, 2006 will have the 2006 penalty amount assessed. A formal policy will be drafted and approved at the March 8, 2005 Board meeting. 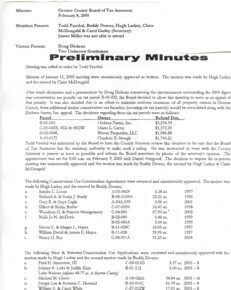 The county attorney will be notified of the Board's new position concerning conservation use breaches. This policy motion was made by Hugh Larkey and the second by Claire McDougald. It was unanimously approved. Next meetings were set for Match 8 & April 14, 2005, both in the Grand Jury Room @ 9:00 a.m.
After no further. business, the meeting was adjourned.